One of the main difficulties in my discussion of Russian foreign policy in Asia—indirectly alluded to in Elizabeth Wishnick’s comments—is a sense of uncertainty about Russia’s direction. While my analysis registers the undeniable closing of ranks between Beijing and Moscow, I fall short of proclaiming the death of multilateralism and highlight sources of tension between China and Russia that work against long-term prospects for a political, much less a military, alliance. My uncertainty is also a reflection of the contingent nature of Russian policymaking, which markedly differs from China in this respect. For all of Xi Jinping’s display of assertiveness and resolve, which, in the eyes of many analysts, has imbued Beijing’s foreign policy with hitherto unseen dynamism and direction, China’s foreign policy is fundamentally shaped by forces of inertia and institutional interests. This is not to say that it lacks imagination—though occasionally that, too. Rather, it operates on the basis of certain principles that were formulated at least thirty years ago, when Deng Xiaoping first inaugurated an “independent foreign policy,” which simply mean that China cannot and will not become anyone’s ally. These principles, though not immutable, serve as a ballast of a kind, preventing rapid changes of direction. By contrast, Putin’s foreign policy is ad hoc, opportunistic, and highly malleable. It is prone to wild swings in response to changing domestic and international circumstances. Much more than China’s foreign policy, it is a consequence of one man’s quixotic beliefs, aspirations, and delusions. Therefore, what seems like a clear trend in Russian foreign policy today may well be reversed at short notice, which is why it is important to see parallel trends and even countertrends. In the case of Sino-Russian relations, this means keeping an eye open for potential conflict even at the height of political amity. If anything, history is witness that Moscow and Beijing have seen plenty of both. All of that suggests caution in making definitive conclusions about the future of Sino-Russian relations. I would, for instance, offer a somewhat different interpretation than Wishnick on Feng Zhongping’s remarks (in the launch of China’s National Security “Blue Book”) that China should “ally with Russia.” In the same breath Feng, who incidentally does not necessarily speak for the Chinese government, also referred to developing “great power relations” with the United States and deepening China’s relationship with Europe. The idea here is even if China pursues some form of a “political alliance” with Russia, the relationship that really matters is that with the United States. At the same time, the strategy of deepening relations with the EU places constraints on China’s support for Russia’s policies towards Europe. In fact, the Blue Book stratagem (联俄, 拉欧, 稳美) is as all-embracing as Deng Xiaoping’s one-time strategy of developing “three directions”—the West, the East, and the Third World. “Political alliance” with Russia in this sense means something of a tactical ploy rather than a predominant new direction for Chinese foreign policy. Even Putin, despite the big bang of his trip to Shanghai in May, has since reiterated that he was not interested in an alliance with China. Speaking recently at Russia’s Security Council, he was emphatic that Russia was not a part of any alliance system, which “to a large extent guarantees our sovereignty.” “Any country, which enters into alliances, immediately gives up a part of its sovereignty.”1 Although Putin was ostensibly speaking about Europe and NATO, the same logic applies to Sino-Russian relations. He has frequently complained about the lack of balance in the relationship with China, notably manifested in the one-sided nature of bilateral trade. At a time when Russia has clearly become the junior partner, any political alliance with China would simply formalize Russia’s role as the underdog, as Putin no doubt understands. These pronouncements need to be kept in mind even as we see emerging signs of polarization of Asia. 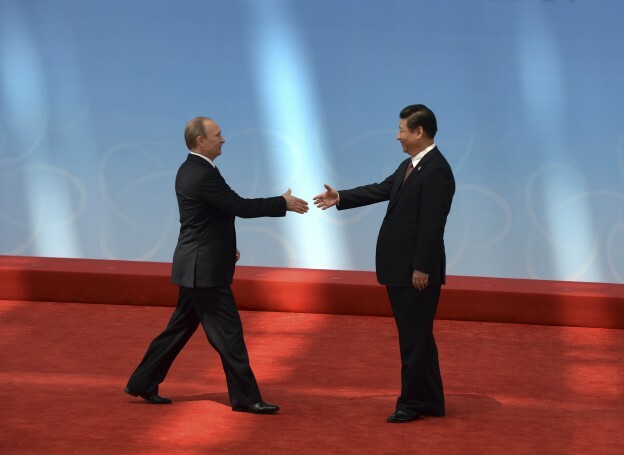 Still, my previous analysis suggests that there is a lot that is holding Russia and China together. The key issue, as I have noted, is their shared fear of “colored revolutions”—popular rebellions with (assumed) foreign backing, as the one that recently occurred in Ukraine, and one like China itself experienced in 1989. Wishnick develops this theme in her comments, suggesting that Beijing and Moscow share more than fear of revolution but also, more fundamentally, aversion to democratic values, disdain for Western conceptions of human rights, etc. I would not disagree with this, though I do think that the basic problem is still fear borne of lack of legitimacy. Political reforms and democratization in both China and Russia would have much brighter prospects were it not for the reasonable supposition among policy elites that any moves in that direction are fraught with rapid unravelling of both regimes. Therefore, a major aspect of the Sino-Russian relationship is mutual support amid fears of a foreign-initiated political meltdown. In this connection, while Rozman’s allusion to a revamped “Brezhnev doctrine” is attractive, I would prefer a different reference point—the domino theory. Just as during the Cold War, the United States had to prop up regimes, e.g. in Southeast Asia, in line with the “domino theory,” so today Beijing and Moscow have to support each other in warding off the specter of democratization, because regime change in either of them would put the other under massive pressure. Another aspect of my analysis that has come under scrutiny of the respected commentators is the notion of “greatness” as a motivating factor in Russia’s Asia policy. Rozman correctly juxtaposes this self-proclaimed “greatness” or “dignity” and the concept of trust, which a more reasonable Russian approach to Asia would bring to the fore. It is here that Rozman’s paradigm about the importance of national identity is most useful for understanding what Moscow has sought, and still seeks, to accomplish. Despite rounds of propaganda about the importance of trust and confidence-building measures in Asia (Putin’s recent visit to Shanghai, in fact, overlapped with attendance at a conference to precisely this effect), Russia neither trusts anyone, nor is, in turn, trusted by anyone, in Asia. Whether this is a legacy of imperial expansion in the 19th century, or of militarization in the 20th, is really a moot point. The reality is that the notion of “greatness” for Putin and much of the Russian populace, is associated with raw military power. The buildup of Russian military power—as we are again witnessing after a 25-year lull— naturally cannot contribute to trust in Northeast Asia. Yet, a more assertive Russia may actually play into multilateral processes, as its gain of confidence may translate into constructive multilateral engagements. It should be borne in mind that at its most militarized—in the 1980s— Moscow positively contributed to the resolution of regional dialogues, e.g. in Cambodia. As to whether Russia’s increasing emphasis on military power may lead to neglect of diplomatic relations with Japan and South Korea, I see no sign of that at the present. The same logic applies to the problem of North Korea—one issue where Rozman and I disagree. I believe that Pyongyang acts in a most reasonable way when it is least under pressure. Conversely, there is a link between external pressure on Pyongyang and its irresponsible foreign policy. The relationship is not always direct and immediate, as sometimes warmongering is a requirement of domestic policy rather than an externally induced reaction. However, the history of Cold War confrontation in Korea suggests that it is precisely when Pyongyang found itself under pressure from all sides that it engaged in the most irresponsible behavior, e.g., its decision to pursue atomic weapons was heavily influenced by its international isolation in the late 1980s—early 1990s, in particular tensions in relations with Moscow and Beijing. North Korean radicalism in the late 1960s also unfolded against the backdrop of considerable tension in Sino-North Korean relations. External pressure and poor relations with neighbors have tended to strengthen a hawkish outlook in Pyongyang, contributing to domestic mobilization and self-legitimation of the North Korean regime. So, when I say that polarization of Northeast Asia will give Pyongyang greater “breathing space,” I mean that North Korea is more likely to cooperate internationally when it has resort to external leverage in the form of good relations with Beijing and Moscow. Rozman notes that if Russia hopes for a zero-island solution of the territorial dispute, it suffers from wishful thinking. While this is true, Moscow’s position seems to be: so what? The gist of Russian—and Soviet—policy towards Japan since the 1950s has been that Japan should be more interested in improving relations with its neighbor than the other way around. This view is nearly perfectly mirrored on the Japanese side with the result that Tokyo and Moscow expect the other to make all the necessary concessions. In recent years Japan has registered some tentative softening of the “four-or-nothing” position. Putin, too, has made it sound as if he was contemplating a compromise. But if he is, he is under no great pressure, for Moscow’s hand in relations with Japan is stronger today than in many years. From the Russian point of view, Japan’s quarrel with China puts Russia in an excellent position of leverage with both. The expectation is that Japan will cave in eventually and agree to a noticeable upgrade of bilateral relations even in the absence of a solution on the territorial dispute. In the meantime, for all his post-Crimea domestic popularity, Putin may well find it unpalatable to contemplate territorial concessions to Japan for fear of incurring nationalist resentment at home. In short, prospects for a Russo-Japanese breakthrough appear dim. Putin’s main direction in Asia remains China.